Since leaving the University of Lincoln, I have been spending time at BBC Lincolnshire as a Broadcast Assistant for a variety of shows. One of the biggest shows I am fortunate enough to now be part of is the Lincolnshire branch of the nationally recognised BBC Introducing initiative. BBC Introducing focuses on discovering and promoting unsigned artists from around the country by allocating a specific department in all of the BBC’s local radio stations. Whilst approaching the end of my time at University, I knew I had to start finding work for when I enter “the real world”, so I utilized the potential of the Research and Development module by spending time at BBC Lincolnshire researching their BBC Introducing programme. By doing this, I got to spend time at the studios which I would have otherwise struggled to acquire. For the purpose of my study, I sat and observed what went on during the production of the programme and by doing this I was able to make myself known to those at the BBC. After finding my way through the figurative door I was invited back to assist the BBC Introducing team, this time setting up studios to record live sessions of bands and musicians to be featured on the Sunday night programme. Before long I was asked by the programme’s presenter and producer, Tim Johns, to join him on 29th June for what would be a special one-off programme broadcasting live from SO Festival 2012 in Skegness. Arriving at the BBC Lincolnshire studios for 12:00, a lot of the preparations were already done by Tim and other members of the team. Alongside Tim and I, we were joined by stage manager Rosie Duffield, reporter Peggy Walker and Tim’s wife Kristina. We arrived in Skegness just after 14:00 and began by setting up 3 giant “BBC” cubes on stage, hanging banners and sharing flyers round local businesses. Passes were given to all the bands, and we had our “AAA” (access all areas) passes too (ironically on BBC Radio 1 lanyards, though I didn’t complain!). Fortunately for us, an external sound team were hired for the event, so the only technicalities that concerned us were simply broadcasting the event between 19:00 – 22:00. Our engineer, Adam, worked from an ex-army vehicle behind the stage which was fitted with a multitrack desk and radio desk. This allowed Adam to ensure the radio broadcast and PA broadcast performed to the high standards of the BBC. The bands were left to do their sound-checks whilst we tested our connections to and from BBC Lincolnshire. Our reporter, Peggy, spoke on-air about the event throughout the day using an iPad which is now commonly used by reporters for their outside broadcasts. Broadcasting software is installed on the iPads allowing reporters to connect and speak on-air from any location at near studio quality. 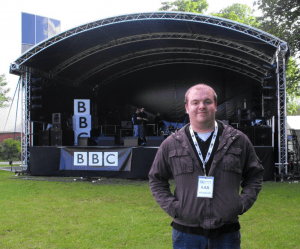 Once the bands finished their sound-checks, and the BBC Introducing team had filled up on much needed fish and chips, the event launched to a crowd of around 400 people in Tower Gardens and the rest of Lincolnshire via the radio. Funnily enough, once the bands had been introduced by Tim and interviewed by Peggy backstage, we were able to simply enjoy the performances. Due to extensive prior preparations, no obstacles were encountered. All the bands who performed originate from the Lincolnshire area, except one band who came specially from Sweden on an “exchange scheme”. East Lindsey District Council are now in the process of choosing one of the Lincolnshire bands that performed to travel and perform in Sweden later in the year. Once the broadcast ended at 22:00, a band from Denmark played the stage to the remaining crowds as we packed away the equipment we had brought with us and returned back at the BBC Lincolnshire studios for midnight. I managed to get home to my bed shortly after 01:00 ready for my usual shift at BBC Lincolnshire the following day working for the programmes ‘Solid Gold Saturdays’ with Melvyn Prior and ‘Summer Saturdays’ with James Lobley and Maria Richmond. I will be working with BBC Introducing again from the beginning of next week, resuming the schedule of recording live sessions.